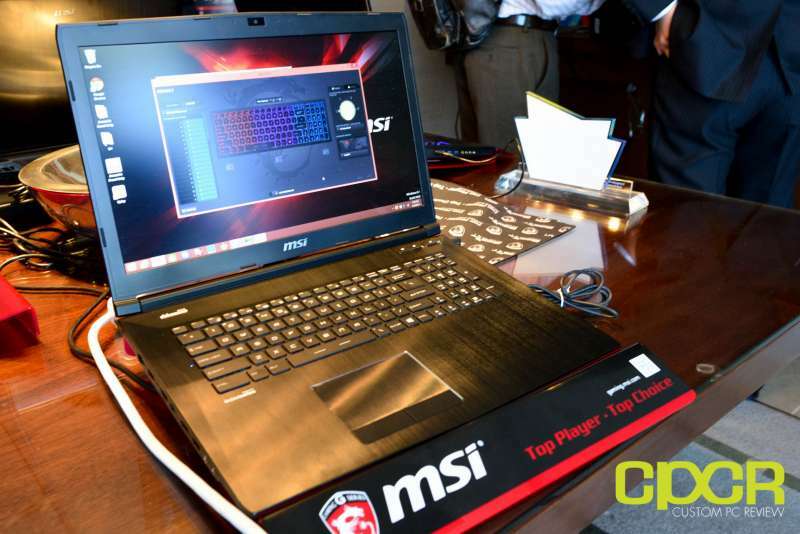 MSI’s biggest gaming laptop introductions at CES 2015 were without a doubt the Cherry MX mechanical switch packing GT80 Titan SLI and the dockable GS30 Shadow, but they also refreshed a couple other gaming laptops as well including the MSI GT72 Dominator Pro. Measuring in at 16.85″ x 11.57″ x 1.89″ and weighing in at 8.4lbs, the 17.3″ MSI GT72 Dominator Pro is more suitable for your desk than it is for your backpack, but given its larger chassis the MSI GT72 Dominator Pro is a serious powerhouse. The configuration MSI had on display was the GT72 Dominator Pro-208 model, which comes with a 17.3″ 1920×1080 matte TN panel, Intel Core i7-4710HQ CPU, Nvidia GeForce GTX 980m with 8GB of GDDR5 GPU, 32GB of DDR3L RAM, 4 x 128GB M.2 SATA SSDs in RAID 0, a 7,200RPM 1TB HDD, 1080p webcam, and Killer E2200 LAN/Killer N1525 802.11 AC connectivity. While this is already pretty powerful, the biggest feature for the MSI GT72 Dominator Pro however, was the fact that it’s officially going to be the first laptop to support USB 3.1, which is capable of transfer rates up to 10Gbps. MSI was also proud of the fact that the GT72 Dominator Pro houses a standard MXM GPU which is upgradeable as long as you can get the laptop to a MSI designated repair center. The MSI Gt72 Dominator Pro-208 is expected to retail for around $2,999.99 and should be available in the coming weeks. 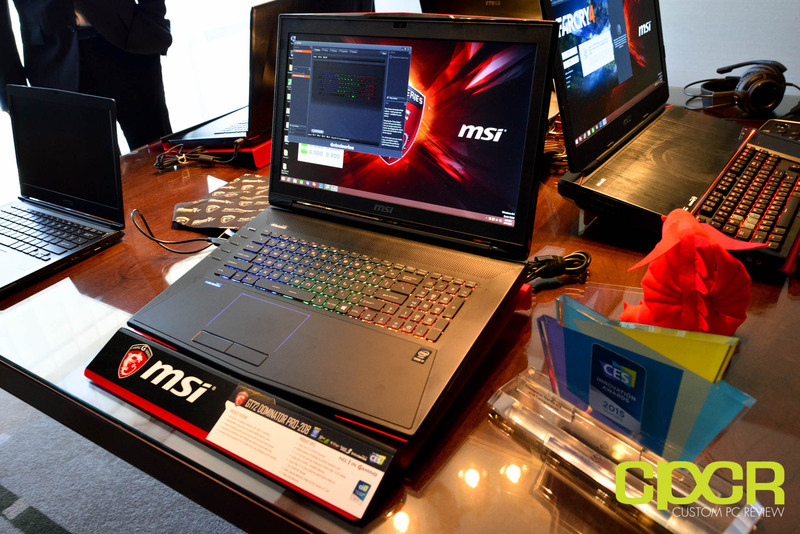 MSI also showcased the GE62 Apache-002, which is a mainstream gaming laptop featuring Nvidia’s latest GTX 965m GPU. The notebook comes with a 15.6″ 1920×1080 matte IPS panel, Intel Core i7-4720HQ CPU, 12GB of DDR3L 1600MHz RAM, 1 TB HDD (2 x M.2 SATA ports available for future expansion), and Killer E2200 LAN/Intel 3160 Wireless AC connectivity. Relatively speaking, the GE62 Apache doesn’t go overkill on specs, but it’s a mainstream gaming laptop designed to be competitive in price. Additionally, with a footprint of 16.49″x 11.02″ x 1.14″ and a weight of 5.95lbs, it’s light and small enough to be carried around comfortably – or as comfortably a 15.6″ laptop can be carried around. 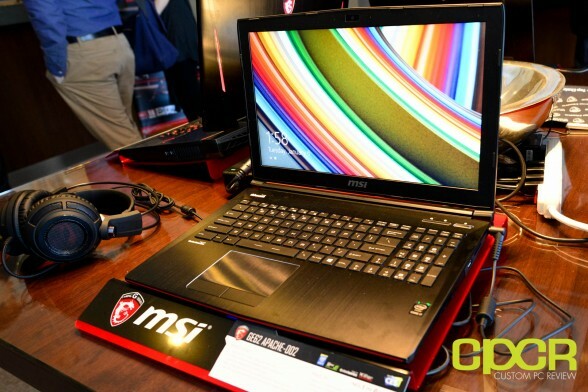 The MSI GE62 Apache-002 will start at $1,399.99 MSRP and should be available in the coming weeks.